attempt to escape “allergen (foreign substance), experience the sensation of sneezing, watery eyes, runny nose, rhinorrhea and itching. 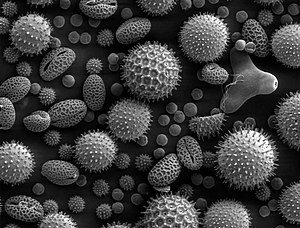 Classical allergens include animal dandruff, pollen, dust mites and molds. The medical term for symptoms of nasal allergies is “allergic rhinitis (“rhinitis”comes from the word ” Rhine “, from Ancient Greek, meaning nose, and “itis”meaning inflammation). Seasonal allergic rhinitis describes nasal allergies that change with the seasons because of plant pollen. In these people, symptoms come and go depending on the pollen of certain trees and weeds. Their pollen levels can vary from day to day, depending on factors including weather. * Try to stay inside your house between 5 am and 10 am. * After you’ve been outside, change your clothes and make a quick shower. * Use air conditioning and change filters often. * Do not smoke in the house. Cigarette smoke is irritating and may intensify symptoms of allergies. * When driving, keep windows closed and use air conditioning (set to recirculation) to reduce exposure to pollen. * Avoid areas such as – basements, garages, barns, stacks of wood. * In the garden, avoid activities that increase exposure to pollens and molds, such as mowing, digging … If you must do these things, wear a filter pollens and molds mask. * Keep humidity in the house at a lower level of 50% to discourage mold growth. If humidity is high, use air conditioners and dehumidifiers. Also consider installing a dehumidifier in the basement or other closed areas. * Clean shower curtain with substance to destroy and prevent mold. * Reduce the number of houseplants as soil encourages mold growth. * Open curtains to allow sunlight to enter the house. * If you use a humidifier, follow manufacturer’s instructions closely and carefully clean on a regular basis. If the humidifier has traces of mold, mold spores can spread into the air we breathe. Which Allergy Medications Are The Best? How do you know if you’re suffering from allergies? Do you have a family history of certain allergies? A lot of people actually do have allergies but some are in minor forms that they don’t really cause that much discomfort to an individual so they tend to take it lightly and never realize that it is one. Over the counter medicines are fairly cheap and work after a short period of usage, some even work immediately depending on the type of allergy and extent it affects a person. A good thing to do in cases of uncertainty is to visit a doctor specializing in allergies. A trained physician will ask questions of your medical history, family history, your diet, environments you’re exposed to, things that you eat, or if you have pets in the house. After knowing this, the doctor will then probably submit you through a skin test. The process is done scratching a series of allergens on the surface of your arm and see if there is a reaction. Depending on what extent of tests you are to take will depend on how often you feel you are affected by the suspected allergy. Specific allergies have specific targets. Over the counter medicines are usually general in type and would cure simple reactions toward skin irritations, rashes, sniffles and sneezing. These types of medicines will not work if you have food allergies. You may need to see a doctor of Internal Medicine to give you better insight on how these allergies manifest themselves in your body. Some anti-histamine drugs do have a sedative property as side effects, so do take precautions when you take them. Do not take them when you’re expecting to drive or handle critical and hazardous machinery. Some of these effects are pretty strong and will cause grogginess and sleep. Although there are some anti-histamine drugs which are being sold now with a no-drowse action. Choosing what allergy medication is best for you can be determined by your doctor. Aside from taking the medicine your doctor may also help you in other ways to manage and treat your specific allergy. This has to do with making a little change to your lifestyle and preferences. It will be a guide on how to control and avoid having allergic reactions. Try to do additional research on the internet regarding your condition. There a various sources of information for this and proven solutions for treatment. Tags: Which Allergy Medications Are The Best? What to look for when Buying an Allergy Purifier? If you experience water eyes, running nose, fever, flu like symptoms or incessant sneezes you may probably have be affected by some airborne allergens. These may happen when you change environments, or they just come down through the atmosphere when there is a change of weather and temperature. A good air purifier may be a safe and affordable way to prevent allergies; it has a series of filters that will help take the allergens out of the atmosphere we breathe. You may wish to install these devices in places that you usually habit; your home, workplace and your car. The way an air purifier works is by removing contaminants from the air; they are marketed to be beneficial to asthmatics, and sensitive people who are suffering from allergies, and also as a device used to minimize second hand smoke from tobacco. These purifiers are made to filter out pollen, dust, mold spores, and dust mite feces because these contain strong amounts allergens which may trigger an allergic reaction with some people. Volatile Organic Compounds (VOC’s) and particles from smoke may also pose as a hazard in the air that we breathe. Constant exposures to assorted components may increase the chances of acquiring sick building syndrome. It is for this purpose that air purifiers are utilized to minimize the concentration of contaminants in the air. There are several steps that a purifier needs to work effectively against the particular purpose that you want to address. A filter works as a trap, which can block unwanted things to produce a refined state of something which you allow to let through. Air filters have an initial stage that starts from a rough holed screen that gradually decreases in size to take away particles at a certain stage at a time. A good High Efficiency Particulate Air (HEPA) filter is supposed to remove at least 99.97% of 0.3micrometer particles. Activated carbon comes next, which is made up of very porous materials and is also used to take away taste in water. The carbon filter changes contaminants from a gaseous phase into a solid one. An Ionizer is a component that can be added-on; its system uses a charged electrical surface to generate an electrically charged gas ion together with an air ion. These ions then attach themselves to the airborne contaminants, and which in turn are then attracted to the charged collector plate. So when shopping for an air purifier, try to look for a good one that offers a sufficient amount of filtration systems to suit your specific need. There are a lot on the market to choose from that are safe and economical to use. Tags: What to look for when Buying an Allergy Purifier? What can You Do to Protect Yourself from Cat Allergies? Do you have a strong feeling that you may be allergic to your pet cat? First thing you should do is examine the symptoms you have. Pet allergies should cause you to have incessant sneezing, nasal congestion, running nose or post nasal drip. You may either get a few, or of all those at the same time. You can be absolutely certain of this if you go to your doctor and get an allergen test specifically for pets. The process is simple; a sample of an allergen from each source will be scratched on your arm. After a few minutes itchiness or inflammation will occur on those spots if you have an allergic reaction. Do not worry; you’re given a topical cream afterward to subdue the reaction. If your tests show positive to your pet cat then there are certain things you must do for your comfort and reprieve. The easiest way actually is to remove your cat from the premises of your home; that is an outcome you would not like though. If you are one of those like most pet owners who can not bear to send your cat away then you will have to adjust certain activities or exposure times with your pet. Close contact with your pet should definitely be limited. Cuddling with your cat will definitely result in one of the symptoms we have previously stated already. Skin rashes that resemble eczema usually develop when you come in close contact. As hard as it is to distance yourself from your pet it is something that you must do if you have severe allergic reactions. You must also take note and be aware of the places in the house that your cat frequents; your bed perhaps, the couch, chairs, the living room carpet and the patio. It is a good idea to use furniture covers, they are easy to install and remove. Make it a point to wash the covers frequently, a surface with an accumulation of cat hair must be taken out and washed. The bedroom may be another place in the house you should not allow your pet into. You need to keep them off the bed most especially; this will help you get better sleep at night. Thorough cleaning is all that is needed actually, open the windows and aerate the rooms. Vacuum as often as possible and do not give a chance for accumulation for dust and hairs. Some vacuum cleaners are also equipped with HEPA filters that are designed for those suffering from asthma and allergies. Tags: What can You Do to Protect Yourself from Cat Allergies? What Can You Do If You Have Dog Allergies? Are you showing signs of a runny nose, sneezing, and watery eyes when in close contact with your dog? These are possible signs of having an allergy. If it is persistently bothering you, then you might want to consider seeing a doctor to be sure. The simplest way to remedy this is to find family or friends to take in your dog, but if you are willing to have your pet around then I guess you will have to take certain steps to adjust yourself to your situation. The best advice to give is to keep your home and surroundings clean. Do not let dust or other residues accumulate in places that you usually habit, your bedroom, living room, bathroom, and your car. Try to have sufficient aeration by opening windows to let fresh air circulate in your house. The use of air purifiers or filters may also help alleviate collection of aerobic microorganisms which may cause allergic reactions or asthmatic attacks. Be very particular about the places where your dog spends a lot of its time, on top the couch or near places of furniture where you usually spend a lot of time. It is a good idea to use furniture covers; a cloth type of material would be best, for they are easy enough to install and remove for fast cleaning. What you want to watch out here is an accumulation of pet hairs. You would need to clean your covers frequently and vacuum around those areas where hairs would stick to. There are some vacuum cleaners and air purifiers which are being sold in the market which use HEPA filters, these filters are designed to help people who suffer from asthma and have fits of allergy. They work by using a series of stages that can screen very small particles. You may also want to take a look at some over the counter medications, they are relatively cheap and accessible to purchase. They work fast for some basic allergic reactions but mostly come with a sedative effect, so it may be a good idea not to take them if you intend to go for a long drive or will be using critical equipment that need your full attention to operate. There are no-drowse versions which cost a little more and are equally as effective. No single remedy will cure you; a combination of taking your precautionary steps as well the medicines will offer you a greater defense and relief from allergic attacks. Tags: What Can You Do If You Have Dog Allergies? What Buying Options Do We Have with Allergy Medications? For those who are plagued with allergies, and are contemplating to use medicine for acquiring relief, there are many available allergy medicines in the market to choose from. Let us walk through the points that we ought to follow when buying medicine for your allergy. In trying to determine the places where you can get allergy relief medicine, it is submitted that such is dependent on the different needs of different people with different allergies and symptoms. For instance, prescription medicines require a note from a physician or doctor and will not be sold without such valid prescription, whereas over-the-counter medicines can be sold and bought more freely. Below is a discussion of different buying options. As mentioned earlier, prescription medicines need the note of approval of a doctor or physician. As most of us may already know, a prescription medication may be acquired from a medical professional through scheduled appointments or checkups. Having a medical insurance usually makes it more affordable to ask for a professional advice. A prescription coverage also comes in handy since it supports any type of prescription as long as you ensure that you use it in a pharmacy that honors the same. If you are wanting of prescription coverage, or you have one but such is limited, ask for generic brands since they are usually more affordable. Selecting the right pharmacy is in fact much more essential than a lot of people realize. If you have various pharmacies to consider then you might want to take some important aspects into perspective. As mentioned, select the appropriate pharmacy that will take in or recognize your insurance. Try to look for prices that are more affordable, the charges vary depending on the pharmacy or other external factors. If it be necessary, pay in percentage rather than customary co-pay, or if not just make sure to go shop around first. Most importantly, take your time and make sure to have as many of your questions answered. Always depart from a pharmacy with more information and not with even more questions. With over-the-counter medicines, you get more freedom when buying them. If you’re a little tight on the budget, you can shop for these medicines at your discount store or local department store. These stores normally offer very good prices, and carry branded medicines at a cheaper rate. Kmart, Target and Wal-Mart are some of the department stores that have their own pharmacies. This is good since you can ask the pharmacists which medicines sold over-the-counter are the best. Tags: What Buying Options Do We Have with Allergy Medications? Do you know of someone who might be suffering from food allergies? Or perhaps you suspect that you might have it yourself and would like to know more information about it? We have listed down some of the most common types of food allergies and a number of important facts that you need to know regarding it. One of the usual types of food that a lot of people are allergic to is milk. However, it is unfortunate that in several foods, milk is a common ingredient particularly in bread and other bakery products. It is a good thing though, that milk is not very difficult to substitute as there are many milk replacement products that can be used to alternate with milk in baking. Concerning the things that ought to be examined, it is vital to talk to someone who is working in a delicatessen. Delicatessens or delis as it is more commonly called, purportedly utilize the same slicing or cutting tools for both their meat and cheeses. When in a restaurant, talking to the cook would prove to be very beneficial in helping you stay away from the foods that cause your allergies. A lot of restaurants make use of butter in most of their foods and even in oiling their pans since butter gives food a more pleasant and flavorful smell and taste. Be wary as well of the ingredient, casein. Such is a milk derivative and is just as potent to trigger an allergic reaction. One other item that several people are commonly allergic to is eggs. But like milk, there have been numerous replacements or substitutes that a person allergic to eggs can use in his food. Baking powder, yeast, gelatin and oil can be used sometimes, as mentioned in cookbooks and online recipes, for individuals that suffer from food allergies. The ingredients mentioned are supposedly intended as egg substitutes for people who are allergic to eggs. Peanuts are very potent even in the smallest doses to people who are allergic to it. If you are allergic to peanuts, please ensure to read carefully the labels and ingredients of all the food you buy and eat. Reactions to a peanut allergy are known to be the most severe. Fish and wheat are also listed as a common type of food that some people are allergic to. To sum it all up, it is essential to make it a habit to check and read the labels of foods before you take them in. It is easy to remember the food you are allergic to, the complicated part is determining whether or not they are mixed into other types of food. Having an allergy can be a very tiring and depressing feeling. It gets you down and not in the mood to do a lot of things. For simple attacks you can purchase over the counter medications which are fairly cheap and work quite fast. Do be aware that the regular ones have a sedative effect, so it is strongly advised that you do not take any of these kinds of medicines if you’re going out for a drive or be doing some activity that requires critical thinking and fast reactions. There are airborne allergens like molds, dust, pollen, and dust mite feces. For example, Molds manifest themselves in form of eye irritation, wheezing, nasal stuffiness, rashes, shortness of breath, fever, fatigue, and flu like symptoms. This is actually a difficult thing to diagnose without tests. Molds breed on a humidity level below 40 percent during humid months. Frequent cleaning of filters of a dehumidifier is necessary. Open the windows to allow ventilation to properly flow in the house. Mold allergies can be aggravated by eating of cheese, mushrooms, food with yeast, vinegar, dried fruits, mayonnaise, catsup, chili sauce, pickles products and preserved foods. Dust mites aren’t really your problem; they feed off dead flakes of human skin. The problem they do leave behind however is their feces, these are highly allergenic. General forms of airborne allergens can be avoided by the use of an air purifier. This machine works by removing contaminants from the air and is equipped with several stages of filters to block out things in the air. You can also acquire allergies from pets, food, and particular medications. Freeing yourself from your lovable pet is not a very happy event, but if you have allergic reactions toward it, finding a foster home for your pet may be an option. Testing for food allergies is done by having a skin test where they subject you to several forms of commonly available food items or ingredients. They do this by scratching your arm with specific allergens; the result will be a little inflammation and/or itchiness. To summarize it all, if you keep your place clean and well ventilated and watch what you eat or take in, you should generally be free of most allergens. You can now sit in the corner of your lovely house and drink some green tea; this has some soothing and calming effects as well as a natural antihistamine property. Trying to find reprieve from allergic reactions? If your answer is yes, then you might want to check out air purifiers. Air purifiers are effective tools that provide relief from several of the most common symptoms of allergies. As a matter of fact a number of people have claimed a total removal of allergy symptoms by using air purifiers in their homes. It is advised that you seek guidance in purchasing an air purifier if this is the first you’ve taken interest in it. There are many kinds of air purifiers that are available in the market. You will wish to continue reading this article especially if you feel overwhelmed with all of the choices. Here are some tips outlined to assist you in choosing an air purifier. It is strongly recommended to look for HEPA air purifiers first when you’re planning to buy an air purifier. This type of air purifier comes highly rated since it has the capacity to filter around 90% of particles in the air including allergens. All of the air purifiers can capture and filter air particles that are potentially harmful like dust mites, mold, and pet dander though some, like the HEPA air purifiers are more efficient in this compared to others. Getting recommendations or referrals from friends, neighbors, coworkers, family and even doctors for good quality air purifiers is another efficient way to go about your search. Because a lot of people have been wanting to improve their health, maintaining clear air inside the home have been one of the contributing factors people have started to consider, hence air purifiers have become more popular over the years. So if you happen to know anyone who owns and uses an air purifier, talk to them for more detailed information about it. You may also do researches online about the make and model of the different air purifiers that you have canvassed or with the ones that you are already contemplating on buying. Don’t be rash in purchasing an air purifier it is always wise to know more about the product first before buying it, especially with things that have to do with your health. There are many reviews and comments about the various air purifiers sold in the market that are posted online. This type of precaution will save you time and money and guide you to steer clear from air purifiers that are too high maintenance and not worth the purchase. Do Allergy Air Purifiers Really Work? If there are times that you have that feeling of watery eyes or have continuous sneezes when you transfer to certain places or there is a change in environment, or perhaps have fits at particular times of the year, then there may be a strong possibility that you are affected by some airborne allergens. These come down through the atmosphere when there is a change in temperature and wind direction. Among several available and affordable ways to treat allergies, some people invest in air purifiers. They believe it can help filter out allergens that enter their home and make the atmosphere inside cleaner. An air purifier initially works by removing contaminants from the air; they are particularly marketed to be beneficial to asthmatics, those suffering from allergies and as a device used to reduce second hand some from tobacco. These kinds of purifiers are designed to filter out dust, mold spores, pollen and dust mite feces because these acts as allergens which trigger an allergic reaction with people. Volatile Organic Compounds (VOC’s) and particles from smoke may also cause a hazard in the air that we breathe. Constant exposures to these components will increase the chances of acquiring sick building syndrome. Air Purifiers are utilized to minimize the concentration of these contaminants in the air. There are several stages that a purifier needs to effectively work against the particular purpose that you want it to function for. A filter is by essence a trap, which upon its design can block unwanted things to produce a refined state of something which you allow to let through. These filters first work by starting from a rough holed screen and gradually decreasing the sizes of the holes to take away larger particles. A High Efficiency Particulate Air (HEPA) filter is supposed to remove 99.97% of 0.3micrometer particles. This serves as your first stage of defense. Activated carbon, which is a very porous material and is also used to take away taste in water, is then employed. It forms a process of changing the contaminants from a gaseous phase into a solid one. An Ionizer uses charged electrical surfaces to generate electrically charged air or gas ions. These ions attach themselves to the airborne contaminants and are then attracted to the charged collector plate. So try to choose an air purifier which can have sufficient amount for filtration systems to your specific need. There are a lot on the market to choose from and are safe and economical to use. Tags: Do Allergy Air Purifiers Really Work?